Elite schools Yale, Stanford, and Georgetown were among the destination universities. There was no suggestion that the schools were involved in wrongdoing. Who was a part of the alleged scam? The defendants are largely wealthy and also include CEOs of major companies. 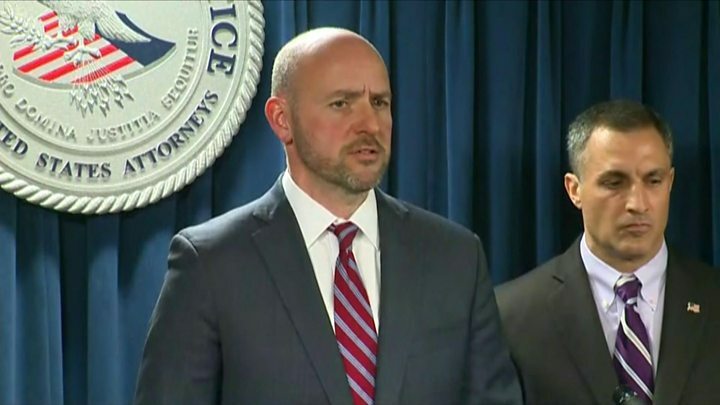 “These parents are a catalogue of wealth and privilege,” said US Attorney Andrew Lelling at a news conference about the case on Tuesday. According to the charging documents, Ms Huffman made a “charitable contribution” of $15,000 (£11,500) to participate in the scheme on behalf of her eldest daughter. She allegedly arranged to use the scheme a second time, for her younger daughter, before deciding not to do so. Ms Huffman was charged with conspiracy to commit mail fraud and honest services mail fraud. She was secretly recorded discussing the scheme with a co-operating witness. The papers said the co-operating witness met with Ms Huffman and her husband, the actor William H Macy, at their Los Angeles home and explained the scam to them. The witness said the pair “agreed to the plan”. Mr Macy was not indicted. The actress Lori Loughlin, best known for starring in the US sitcom Full House, was among those indicted. Ms Loughlin and her husband Mossimo Giannulli – who was also indicted – “agreed to pay bribes totalling $500,000 in exchange for having their two daughters designated as recruits” to the University of Southern California (USC) rowing team, the documents said. Both their daughters are currently studying at USC. Federal prosecutors in Boston charged William “Rick” Singer, 58, with running the alleged scheme through his company Edge College & Career Network. Mr Singer pleaded guilty on Tuesday in Boston federal court to charges including racketeering, money laundering, and obstruction of justice. He could see a maximum of 65 years in prison and over $1m in fines. He told the court: “I am responsible. I put all the people in place,” local news site Mass Live reported. Mr Singer will be sentenced in June. According to the FBI, athletics coaches at various institutions were also involved in the scheme – recommending the fraudulent applicants internally and pocketing bribes in return. The head women’s football coach at Yale University was allegedly paid $400,000 to accept a student who did not even play the sport – and those parents gave Mr Singer $1.2m for arranging the bribe. “This case is about the widening corruption of elite college admissions through the steady application of wealth, combined with fraud,” Mr Lelling said. In all, 33 parents were charged as well as 13 athletics coaches and associates of Mr Singer’s business. The documents detailed two alleged scams run by Mr Singer’s firm, Edge College & Career Network: Cheating on college entrance exams and using connections with coaches at top schools to organise bribes while faking athletic credentials for students. “Some parents took advantage of one…some took advantage of the other, and some took advantage of both,” Mr Lelling said. Parents including Ms Huffman and Ms Loughlin paid somewhere between several thousand dollars and $6.5m to Edge for its services, authorities said, earning Singer about $25m between roughly 2011 and 2018. The firm reportedly instructed parents to claim their child had a disability which required extra time for exams. The FBI said parents were then told to invent an excuse – such as a family wedding – for their students to sit the entrance exams at specific facilities, where staff had been bribed to turn a blind eye to cheating. Someone working for the firm involved in the scandal either sat the exam for the students, gave students the answers, or corrected their answer papers, the FBI said. The Edge staff member who assisted in the cheating was briefed on exactly how well to perform, in order not to raise suspicion that a child’s scores had improved too much, the FBI said. In most cases, the students did not know their admission had been paid for with a bribe, but in several the students were involved, officials added. The firm also allegedly created detailed fake athletics profiles for students – including photo-shopping the faces of potential students on to pictures of athletes found online – allowing students to be recruited on athletic scholarships. USC said they are aware of the investigation and are conducting an internal investigation. Georgetown, Yale, UCLA, Wake Forest and the University of Texas released similar statements acknowledging the investigation. On social media, many have expressed outrage over the alleged scam, pointing out that the US college system is already biased in favour of wealthier, white Americans. And others have noted that for the mega-rich, it’s easy to legally donate money to a school in order to receive admission. Also. Additionally. It’s always been common knowledge that rich white folk use their money to “help” their kids in illegal ways. I’m more surprised that they’re being prosecuted for it. It’s “the largest college admissions scam ever prosecuted by the department of justice” Whew. ← Brexit deal: How did my MP vote?